What would his decision be? On a live television broadcast, the rugged young celebrity considered his options one last time. The audience members watched him with bated breath, each with their own loyalties at heart. Whichever team he chose would be feeling the reverberations for years. Finally, with no more hesitation, he plunged his eight tentacles into the box on the right and devoured his mussel reward. No, I couldn't pass up the opportunity to write about octopuses and sports twice in one week. Paul (what kind of a name is that for an octopus, by the way? 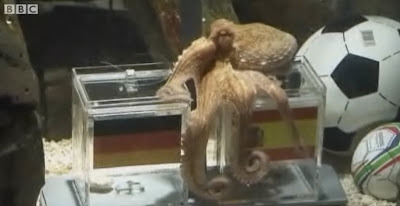 It's like when someone names their golden retriever Katie, and when they call for it in the park you think they've lost their child) is a 2-year-old octopus living in an aquarium in Germany. He has correctly predicted the outcome of all six World Cup games that the German team played this year. In 2008, he went four for five in predicting winners of the European soccer championships. For each game, Paul is presented with two clear plastic boxes. Each box holds a tasty mussel and displays the flag of one of the two teams. The box Paul dines from first is supposed to represent the winning team. When asked to choose between Germany and Spain before Wednesday's game, Paul initially sat on top of the German box for a moment--then dove decisively into Spain's box. After his prophesy came true, the octopus's countrymen turned on him. Several German newspapers called for him to be thrown in a frying pan, even offering recipe suggestions. This morning, Paul made his most anticipated pick yet, choosing Spain over the Netherlands to win the World Cup finals. Paul does add another layer to the question of which team you're rooting for. Maybe you're hoping to see Paul crash and burn. Personally, I don't have strong sports loyalties or any known genetic ties to Spain or the Netherlands. I picked Argentina to win it all in my knockout pool (though my picks were, possibly like Paul's, largely random). So in the absence of another reason to root for someone, I'm going to have to cheer for the octopus. Viva el Pulpo Paul! This is a great story. It reminds me that it has been too long since I've watched some of the amazing youtube videos of octopuses squeezing into and out of preposterously small holes in boxes. I also now know, due to wikipedia, that octopi is not the proper way to pluralize octopus, since the word is not Latin in origin.